After all the speculation about whether Bell, Key, Shah or Vaughan would be England’s number 3 batsmen against the West Indies, the collective gasp from the nation’s cricket writers was almost audible even outside of London as none of the aforementioned candidates even made it into the squad for the First Test. Ravi Bopara is now expected to fill the third slot in the England’s batting order. Whilst I’m a fan of Bopara, he doesn’t strike me as a Test number three. It has always struck me as a little strange that Kevin Pietersen is so reluctant to bat at three, which suggests that he doesn’t rate himself against the new ball. To think that Kevin Pietersen doesn’t rate himself at anything is so counter-inituitive that it makes my head hurt. There was much excitment in some quarters when it was announced that English players would be available for the second season of the IPL, and Chennai and Bangalore alone spent $3m between them on Flintoff and Pietersen respectively, but how have England’s IPL stars got on so far? 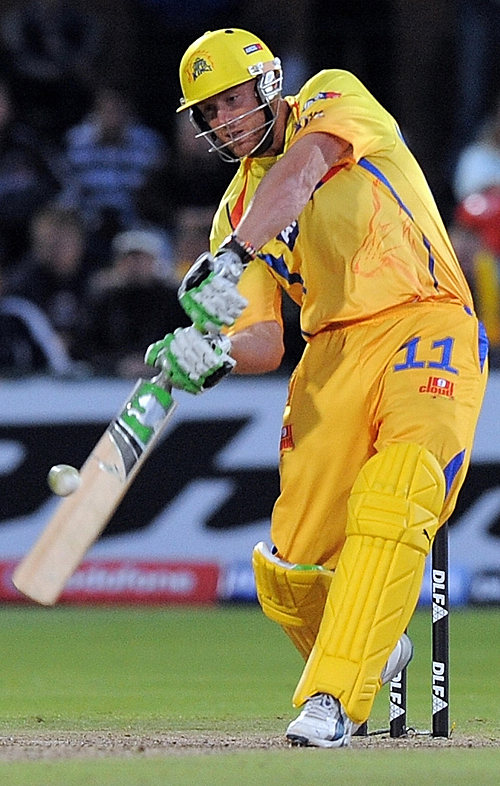 Andrew Flintoff showed his quality against Bangalore, but suffered against Delhi, going for 50 runs in his four overs. Injury, of course, has curtailed his IPL adventure for now, but Chennai certainly haven’t had their money’s worth yet. Kevin Pietersen has struggled too, getting out cheaply in nearly every innings. His famed aggression hasn’t always been on display for Bangalore (at least not until after he’s out), and the treatment he’s getting from the South African crowds can’t have helped. Having captained his side to four defeats in a row, the Royal Challengers might not be too upset to see the back of him when he returns to England. Dimitri Mascheranhas, the only English player with prior experience of the IPL, made an explosive start to his second season, taking 2 wickets in 2 balls, and batted well against Kolkatta. He seems to have graduated from last year’s bit-part at Rajasthan to the role of front-line bowler, and has taken the wickets of some very good players indeed. Owais Shah has apparently enjoyed practising his Hindi with his Delhi Daredevils team-mates, and has had plenty of time to, with little in the way of cricket to occupy himself with. Ravi Bopara blasted 84 from 59 balls against Bangalore, and claims that he has now learnt how to open in Twenty20 cricket, something that may bring cheer to England ahead of the World Twenty20 in June. Paul Collingwood has made it onto the field, but only as a substitute fielder (would it be cruel to suggest that Delhi signed him with that in mind? ), and may not get a chance before England duty calls. Graham Napier may have been excited just to be involved in the competition, but he hasn’t yet featured for the Mumbai Indians. Michael Vaughan missed another chance to prove his form ahead of the announcement of England’s sqaud to play the West Indies when he fell to fellow England outcast Steve Harmison for 24. Television replays suggested Vaughan may not have got a touch on the fatal ball, but the evidence from the single available angle was inconclusive. The selectors almost seem to be looking for an excuse to pick Vaughan, so this score will frustrate them as well as their former captain. The number three spot is looking increasingly like it might end up being filled by Ian Bell, which is fine if he’s in form, but it’s only a matter if weeks since he was dropped, so it seems more likely that any recall would owe more to the lack of options available than to a belief that Bell has improved in the intervening period. Indeed, his attitude to being dropped suggests little or nothing has changed.